180mm faced Hanger with 45-degree Baseplate in stone finish. Choice of Solid or Hollow axles, Springs in four (4) strength options. For optimal traction, power, and control, we usually suggest a 45-degree truck at the nose and a 30-degree truck at the tail, with stiffer springs at the tail than at the nose. Use two 45-degree trucks on symmetrical (twin-tip) freeride decks. 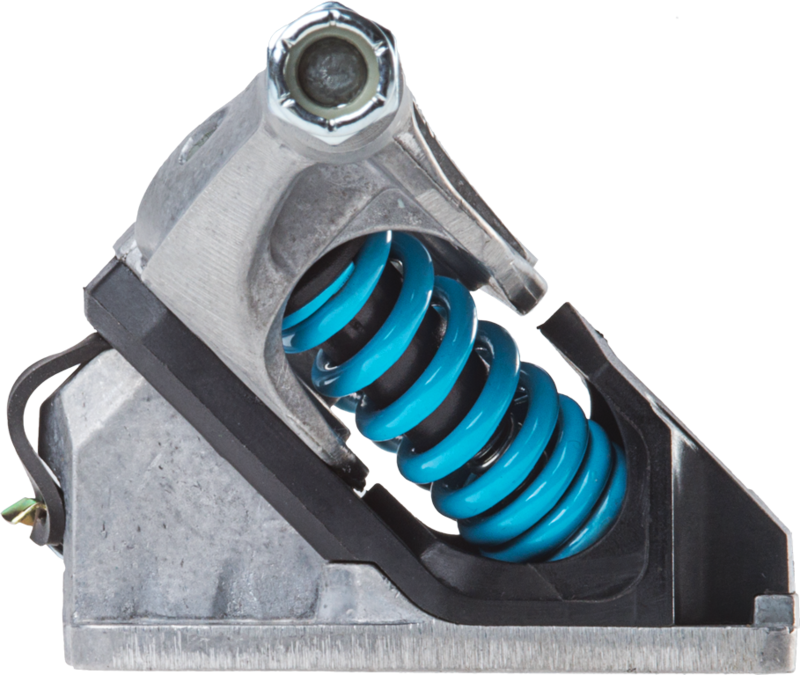 Use stiffer springs if you’re heavier and/or taller than average, softer springs if you’re lighter and/or less tall. The original precision longboard truck – five generations later! A major upgrade to our flagship high-rebound truck technology. No truck has more energy return, more precision, or better steering control. The world’s best for pumping! Our crack team of engineers and industrial designers scoured every cubic millimeter of the previous (G4) model – looking for material to trim and spots to toughen, all while improving aesthetics. Breakthrough Spring Cap design keeps Springs much straighter as they compress – resulting in a larger turning range and enhanced steering control. Thicker, stronger Pivot Bolt is easier to remove and install, and it threads more securely into a larger Baseplate Locknut. Stronger, reusable Pivot Bolt Clip is easy to remove and install by hand, and it’s fastened to a rubber “leash” that prevents it from ever getting lost. Ingenious new multi-part Baseplate structure creates uniform thickness at mounting corners, so you need mounting bolts of only one length. What can I say – these trucks are a work of art. I have an engineering background and a general appreciation for well engineered products, and these are light years ahead of any other truck I have seen and/or used. They are very precise, tune-able, and have none of the squishy feel of the bushing-style trucks I have seen or used. My son has the previous version of these on his board and they are also great. Nobody in our area has ever seen a Seismic truck, so they have a bit of novelty to them as well and people are curious what they are. Customer service from this company is exceptional as well. One of the small c-clips was broken upon arrival, and some spares were sent out to me immediately. I also purchased a set of 85mm Speed Vent wheels and Tekton bearings with these trucks, and all of the products from this company are excellent. The trucks are amazing. I’m running the 30* in back and the 45* up front. Installed them on my carving setup with purple springs on 30 and light blue on 45. After reading lots of forum posts on them, I decided to take the plunge. I wanted a more progressive lean that provided excellent feedback. My expectations were blown away. I’ve still got setups on bushings, but they are collecting dust. Carving is what I bought the trucks for and they deliver. A quick note about the customer service, because to me, this is what gains my loyalty. I had a question about my setup, which was answered in less then ten minutes by Dan himself. LESS THAN 10 MINUTES! His answer helped me dial in the setup that I wanted, and with the installation of some risers, I was on the street as soon as my package arrived. Seismic is a great product with great people behind it. They’ve made a loyal fan out of me and I bet they do the same for you. LUV!!! Now I need some 30′ but these simply rule and I could not have picked better tech to support my ride.